Hello folks, it’s the last few days of the year, so it’s about time to review the reading goals I had set for 2017. To begin with, I must say that I had a decent reading year, not as great as 2016, but not bad either. I had 5 goals that I intended to work towards, I completed some of them, and made progress towards the others. So I guess overall it wasn’t that bad, it just wasn’t anything to brag about. Anyway, without further ado, let’s get on with it and take a closer look at what I did/did not accomplish. This was a success. I had a relatively slow start to the year, but in the second half I heard quite a few audio-books, which is what primarily helped me accomplish this goal. So as of today, I have read 39 books, and I’m currently on my 40th one – The Wife Between Us, which I must say is simply unputdownable (not a word, I know), so I’ll likely finish this one as well before the year ends. I made progress on this goal, but I couldn’t complete it. I got to 4/7 pending categories, which means there are still 3 more to go. But this was one goal I could have finished, had I planned in advance, to put these books on hold in my library (when there was still plenty of time left). But I left it to the last moment, and as a result, my library holds for all three of these books, came in just in the past week. So while I’ll probably get to all these books in Jan 2018, as of today, this is a fail. Here again, I made progress, but did not accomplish the goal. I only read 1 complete series The Lunar Chronicles, which by the way I adored, so much so that this book/series has made it to my All Time Favorites, and is pretty high up on that list. So even though this goal is not complete, I am glad I had this as a goal, because it was the main reason I stopped procrastinating and picked up this series, which brought me so much joy. Okay, this goal I did accomplish, but it’s more complicated than that. During the beginning of the year, I had a goal to read through my entire physical TBR (ha! ), and get it down to 5 books, if not 0 (what can I say? I suffer from irrational unbridled optimism when it comes to books). At that time I had 19 books on my physical TBR, which meant I had to read at-least 14 of my owned books. I don’t know what possessed me to actually believe this was a realistic goal (possibly the aforementioned optimism), but I did. Anyway, by mid year, I came to my senses and revised the goal to reading only 4 books instead of 14. And while I did accomplish that, I also proceeded to buy a whole lot of books this year. Which is why, while I completed my revised goal of reading the 4 books, I have more unread books on my shelves than I started the year with. So make of that what you will, for now I am counting this as a success, albeit a complicated one. This was a success. Not a complicated success like the previous goal, but a simple, straightforward one. I participated in 2 readathons (Diverseathon for which I read If I Was Your Girl and Dewey’s 24 Hour Readathon) and 1 buddy-read (Jane Eyre with Bookish Muggle), and I have to say that I loved all of these experiences, and am extremely glad that I made this as a goal. As far as 2018 is concerned, I’m not setting any reading goals for the year, except the number goal that I will set on Goodreads, which is to read 40 books. I’ve been slowly upping my goal on this front, from 30 books in 2016, to 35 in 2017, to now 40 in 2018. I know it might not seem like a lot to many of you who read literally hundreds of books every year, but it is a realistic goal for me, considering everything else that I’ve going on. As far as to why I’m not setting other reading goals outside of the number goal – it’s mostly because this year, I want to sort of go with the flow, and read whatever I feel like reading, without any kind of pressure to read a particular thing. Not that I ever force myself to read something that I don’t want to, as is evident from the fact that I haven’t been able to complete all my reading goals for the year. It’s just that I want to try going goal-free this year, when it comes to my reading. And if, during the year, I feel like I need a little nudge, or some added motivation to accomplish some things on my reading wishlist, I’ll just include those reading goals in my quarterly goals (which I do anyway). In-fact I am pretty sure the reading goals will be a regular feature on there, because I already do have a couple of things on my mind that I’d like to accomplish in 2018. For instance, I’d really like to read all of Jane Austen’s books that I haven’t read yet, and that is something that will take some real focus on my end, so that I’m not continually getting distracted by the new and shiny books. But at the same time, I’d like to achieve that goal in bite-sized chunks, without it hanging over my head all through the year, if you know what I mean. Anyway, that’s all from my end, folks. I would love to hear from you. 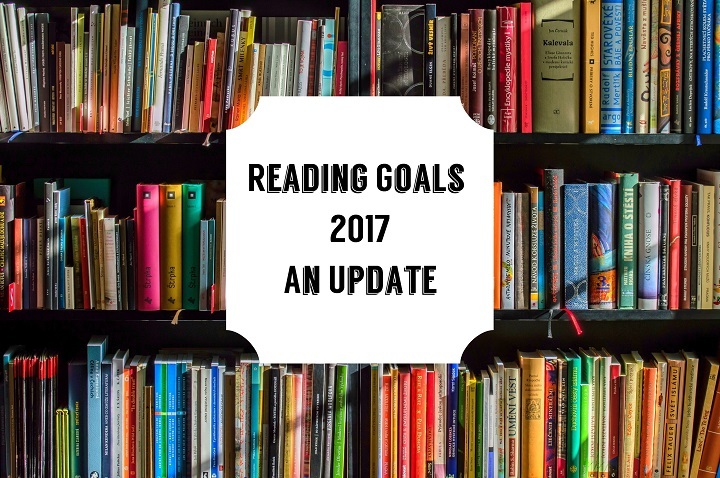 Did you set reading goals for 2017? How have you done on them? Have you set goals for 2018? Reading or otherwise? Well done on those goals! I’m impressed you only had about 19 books on your TBR list at home…I had about 80 at the start of the year and have bought more! Yipes! Happy reading in 2018! I think I might consider monthly/quarterly goals in general like you do. I like the regular reviews and accountability. Whoa….you’ve done great! I have not been able to catch up with a lot of reading off late. Audiobooks sound like a doable idea. I should probably try them. Wish you all the best for 2018! Your goals are a dream to me! With two kids I barely get time to read ( apart from text books and tinkle) I mean! But you have motivated me to cut down on excuses and get down to reading! That’s an awesome year in terms of reading! And I totally agree with you about owning a lot of unread books and buying more books even when you have a lot of unread books. Aw, it’d be really neat to read a bunch of Jane Austen in 2018! And oh my gosh, readathons are always such a good goal to set and meet. I did readathons for the first time last year (I think? maybe??? ), and I found them to be immensely satisfying. In 2018 I am setting goals that are pretty similar to my 2017 goals — reading my own damn books, reading a few histories of African countries, etc., plus a big rereading project. We’ll see how it goes! Ahh..re-reads..those have just fallen off my radar. Of-course I am not counting the HP re-reads here, because it seems like I am always reading/listening to those books..always. But there are so many other books that I love. I really should make more time for re-reading them. Wow, you did extremely well with your reading goals, Shantala! I’m impressed. I don’t normally set reading goals but I always have a book on the go. Goodreads had this cool end of year summary of the books (and # of pages) read for the year. I was surprised to see I had read 24 books. That was more than last year. I still have not tried audio books. But for this year, I’ll probably set goals aligned with writing. Congrats on your goal accomplishments for 2017!! Hmm.. I’m in the middle of doing my reading goals post and mine sounds a lot like yours. Congratulations on reading 40 books. I barely managed to squeeze in 35 – just in time. My own lost also remains half done and I hope to complete it this year. I like the idea of going with the flow. I might just do the same. 40 Books is amazing considering I could do only 18. But my target for this year is to read my own books. My TBR is not reducing and I can read them happily for the next 2 years. You’re far more courageous than me – I upped my goodreads goal but two books this year – 35 to 37! Other than that, like you I’ll be completing my last year’s list plus my own unread books. It’s criminal to keep buying books and not reading them. I desperately need to bring down the pile – either read of dispose off.